Krystal and Kevin with their son Emery. Until a month before Kindergarten, our son was on track in every way for a successful kindergarten year. He had been healthy for four years with barely a cold, breezed through preschool with no issues and then, all of a sudden, our lives were turned upside down. The transition to a new environment, a kindergarten classroom setting, seemed to exacerbate things badly. When we think back to those early months of school, we were either at the Doctor, in the principal’s office, or at home crying about what was happening with our son and how powerless we felt to help him. We began saving money for private school tuition because it seemed obvious that at some point, this charter school wasn’t going to be able to meet his needs. It’s hard to express how grateful and relieved we were when Mr. Quadros, our head of school at Blackstone Valley Prep, told us that Emery would be a “BVP scholar” for as long as we chose to keep him there no matter what he needed. We are uniquely blessed because the leader of our school has a teaching background in special education coupled with an unwavering commitment to finding solutions and getting kids what they need. 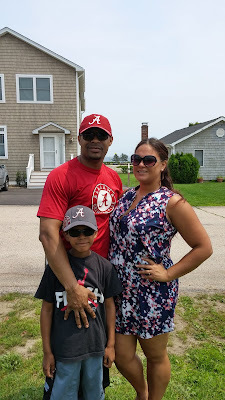 His first plan was to shorten Emery’s days to half days; it was clear to him and to us that at least for the time being, our son wasn’t capable of being in school a full day. And then, shortly thereafter, the school did something pretty amazing. They created the TLC program (Transitional Learning Center) which meant a new classroom for him (and for four other children) who they were confident could learn and progress in a smaller and far more individualized program. Emery would return to full days as an inaugural member of the TLC program. As soon as Emergy started in the program, Ms. Rainha, the lead teacher and special educator called us every single day to share the good and the bad and to make sure that we were on board with ‘the action plan.’ She also consulted with Emery’s doctors by phone. Within a month, he was a new kid. He would jump out of bed in the morning excited to go to school, proclaiming that he wanted to go see his friends and learn something new. Our son was having success in school and loving being there. It is frustrating to hear public officials and others make the claim that charter schools do not serve children with special needs. We think Emery’s needs are very special. Whether it’s his strict diet that can’t be altered, his epilepsy, his anxiety, or his adjustment disorder, his needs are being met by a charter school. But most important in our eyes is that they have found a way to get him to learn. And he loves learning. And the proof is in the pudding. Emery’s Neurologist has expressed that she is ‘stunned’ by his academic progress. He is currently performing at grade level and his doctors have admitted that they can’t explain how or why. BVP has challenged our son. Not only does he think he can climb the mountain in front of him but he is ready and excited for the next one. Ms. Rainha, Mr. Quadros, and the whole BVP team have completely changed how Emergy feels about school and allowed us, as a family, to feel secure. There is no adequate word in any dictionary that can truly capture what our school of choice has done for our son and for our family. But one look in Emery’s eyes at the mention of school and anyone can see what we mean.